Charlotte County Airport Authority has both aviation and non-aviation sites at PGD available from one acre to 150 acres with water and sewer. For more information, contact 941-639-1101 or email airport@flypgd.com. Land leases are available with and without runway access for terms up to 49 years, and up to 150 acres depending on availability. Lease rates are 8-12% of the land value, negotiable based on the length of the contract and property size. Leases are subject to Fair Market Value increases. 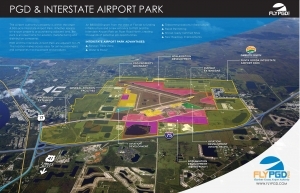 The Charlotte County Airport Authority will pay a commission on all land leases and building leases to licensed real estate agents who are the procuring cause of a tenant ready, willing and able to perform a transaction at PGD.